NEW YORK — Minnesota’s Miguel Sano has been suspended for one game and fined by Major League Baseball for what the sport termed “aggressive actions” that caused benches to clear during a game against Detroit last weekend. Detroit’s JaCoby Jones was hit in the face by a pitch from Justin Haley in the third inning of the Tigers’ 5-4 victory Saturday. Two innings later, Detroit’s Matthew Boyd threw behind Sano, who pointed his bat toward Boyd and yelled out at the mound. Tigers catcher James McCann intervened and appeared to put his mitt in the face of Sano , who reacted immediately with a right hand to McCann’s mask. Joe Torre, MLB’s chief baseball officer, announced Sano’s suspension Monday. The players’ association appealed, allowing Sano to continue playing until the appeal is heard and decided. Boyd was fined after MLB concluded he intentionally threw a pitch at Sano. Twins general manager Thad Levine said the organization will support Sano’s decision to appeal “by providing video and some commentary around the situation that Major League Baseball may otherwise not have the benefit of.” He didn’t elaborate on what that was. 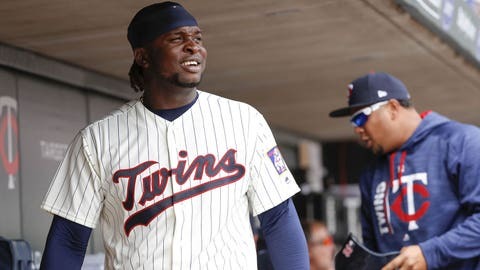 “In my head, I didn’t do anything wrong, so we’ll see what happens,” Sano said through a translator before the Twins’ game at Texas on Monday night. Twins manager Paul Molitor said the team thinks it has a “fairly legitimate case” as to why MLB should at least consider reducing the penalty against Sano.